Shay Logan was dismissed after the win over Celtic at the end of last season. 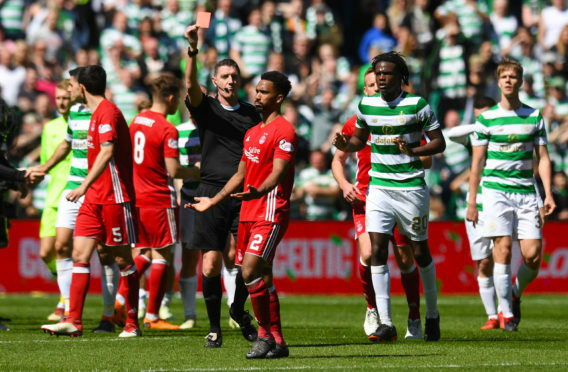 Logan was sent off after the final whistle following the 1-0 victory in May for an altercation with several Celtic players, who had reportedly taken issue with him over-celebrating. The Aberdeen defender was subsequently handed a three-game suspension which the Dons unsuccessfully tried to appeal before Logan alleged he was the victim of racial abuse from Celtic supporters. McInnes is a vehement backer of his player and insists he has no concerns about Logan returning to Parkhead today. He said: “I’m not worried about him because he’s not worried about it. It was all really unfortunate how it played out that day. Shay was actually trying to acknowledge the Celtic fans and was clapping them at the end. I’m not saying that he was holding an olive branch because Shay is his own guy. “I thought the actions of one or two Celtic players made that whole situation worse. For the referee to then deem what Shay did a red card offence, when we’ve had to deal with players over-celebrating if that’s the case at our place – there was no red card offence by Shay Logan. McInnes admitted he had a great deal of sympathy for Logan in the aftermath of that game, which Aberdeen won 1-0 and guaranteed themselves second place for the fourth season in a row. He added: “Shay wears his heart on his sleeve, shows a lot of emotion, and he’s one of very few players like that in the modern game now. He’s the type our supporters can relate to and love and he might be the type to irritate other supporters. On that day, he was doing everything he could not to. That all blew up in his face and I felt for him.